Do You Know The 10 Most Influential Factors Driving A Consumer’s Decision To Buy? As consumers we all have a growing level of sophistication, expectations, and control when it comes to making a decision to buy. As a business, if you aren’t keenly attuned to what makes your customers decide to buy, you’re dead in the water. I recently came across this graphic by Big Commerce that talks to my point. They focus on e-commerce shops. But, if you look at the big picture, their stats apply to all businesses. The numbers perfectly illustrate the strength of and necessity for customized online marketing and readily available resources to compete for customers. 1. The most important store feature driving purchasing decision (80%) is competitive pricing. 2. 90 percent of consumers watch videos about tech products before they buy. 3. 81% of consumers are influenced to buy because of their friends’ posts on social media. 4. Product quality is thetop factor (56%) driving purchasing decision. 5. 62% of shoppers research big-ticket items in-store before buying online. 6. 54% of consumers own a smartphone, and 76% of them use their phone while shopping to help make buying decisions. 7. 44% of consumers are most likely to engage with branded content that contains pictures; video content is close behind at 40%. As a follow-up to my last blog on creating dynamic content, I thought it would be helpful to include some stats on the topic. There’s a well-deserved buzz in the industry over content marketing. That’s because it works by attracting the hottest prospects and keeping them engaged until they’re ready to buy. 70% of buyers view four or more pieces of content when considering/making a purchase. B2B vendors that invest in content and take the time needed to customize their online offerings generate 67% more leads than their competitors. 56% of advanced B2B marketers said content-based offers were their most successful campaigns. I’ve talked quite a bit about segmentation. Now let’s discuss it’s partner, dynamic content. Dynamic content is the best way to make sure your e-mail marketing campaigns are the most relevant for each segment. So, you begin with a single campaign and make tweaks to the text, images, offers, etc., so that the campaign speaks directly to each of your segments. This method is highly effective while giving you the distinct advantage of being able to see how well each message performed, breaking your results down by segment. By creating dynamic content, you are speaking directly to your prospects’ needs, building stronger relationships, increasing your open and click-through rates, and improving your sales and ROI. Start small, just two or three segments. Keep your campaign simple, with targeted content specific to each segment. Have at least two metrics to measure your results and make changes as necessary. Analyze your results frequently to determine what’s working and what isn’t. Just as the name suggests, dynamic content is ever changing, so be prepared to keep your content fresh on an ongoing basis. It always gives me a moment of pause when I think about how far marketing strategies have come in a relatively short amount of time. And, thank goodness they have! Now, there are many ways to influence potential prospects. Segmentation is one of the major ways. Segmentation is possible through the different online communication tools we have at our disposal. So, online marketing is not only far less expensive than traditional forms of marketing, but it’s also easily tailored to your target market, making it far more impactful. Online marketing can be interactive in ways never before possible. This interaction allows marketers to categorize our prospects into segments based on their activity to our online communications, increasing our conversion rates in the process. In order to increase your e-mail marketing metrics and conversion rates, segmentation is an essential. The reason segmentation is so effective at increasing conversion rates is because your campaigns can be highly targeted to each segment, speaking to the exact information each group is searching for from your brand. This is far more impactful than simply sending the same message out to all of your prospects. 2. Behavioral – Captures information based on the prospect’s behavior like web pages visited, webinar attendance, responses to e-mail offers, marketing content downloads, forms submitted, and purchasing behavior. You can add in time frames to increase relevance. You want to begin by identifying the common problems or needs your product or service meets. Segmenting groups like prospects with common attributes and behaviors. Ideally, each segment will be significantly different from the other to make it easier for you to create targeted marketing strategies. Once you create your segments, new prospects will be funneled in to the different segments as they meet the requirements for a particular segment. The more automated your process is the better. There are good software packages out there that enable the segmentation to occur seamlessly, notifying you when a prospect has become sales ready. 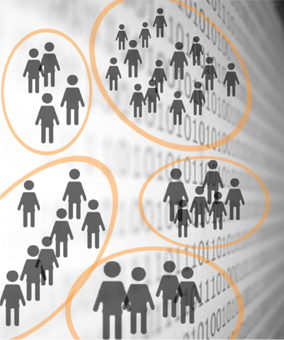 The success of your segmentation will rely on your ability to gather the right demographics and behavioral data. You’ll then need to create targeted campaigns that talk directly to each different segment. As I usually suggest when starting out, keep it simple and automate as much as possible. 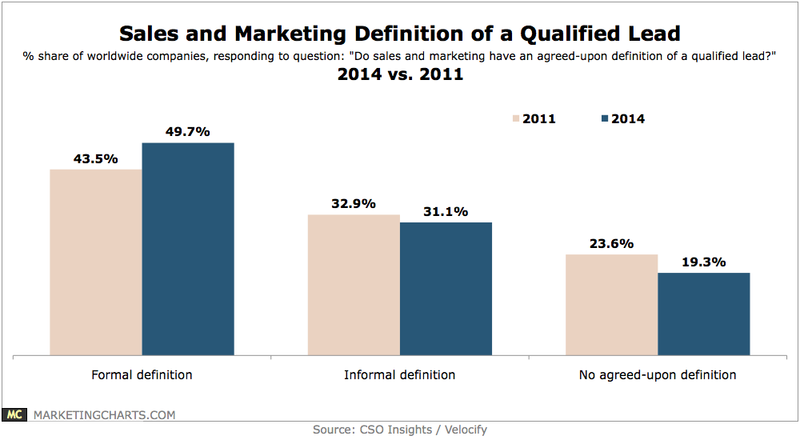 As the table above indicates, only about 19% of companies have an agreed upon definition of a qualified lead. How about you? Do you have a definition of a qualified lead that both marketing and sales have signed off on? 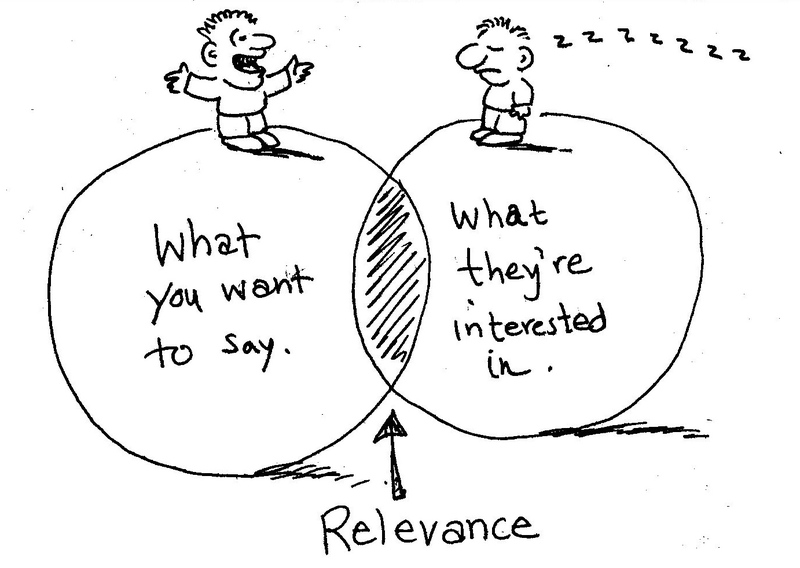 This is a very important element to creating an alignment between sales and marketing. The definition of a qualified lead will vary from company to company, but all will be based on historical lead data and the desired demographics and behaviors of your target market. Keep in mind that nothing is set in stone. If, for some reason, the qualified leads being sent to sales aren’t working out, rework your definition of a qualified lead as well as your scoring system. So, where do you begin? Here are the key steps I recommend sales and marketing tackle together to reach an agreed upon definition of a qualified lead. Before you can begin to define a qualified lead make sure everyone agrees on what is considered a lead. Once there’s an agreement on what a lead is, you’ll need to decide what you’re going to do with the leads. Those leads at the top of the funnel who have shown interest by taking action like downloading a white paper or registering for a webinar or e-book will need further nurturing by marketing. Leads that fall in the middle of the funnel are those leads who have requested a free trial or more information and will need to be passed on to a lead qualification team. Finally, leads at the bottom of the funnel are the hottest – viewing pricing pages or completing an application – and will need to be sent to sales as quickly as possible for further action. What Do We Consider A Qualified Lead? Do they have the means to buy? What is their analytics score? Are they ready to talk to sales? If the lead meets these qualifications, they should be considered a qualified lead ready to be passed on to sales.